I am honoured to be kicking off the blog tour for a very special collection of short stories commissioned to commemorate the 100th anniversary of women receiving the vote in the UK. 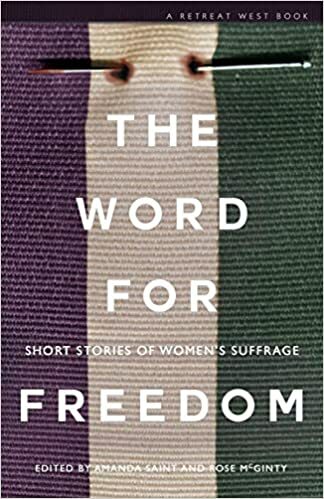 The Word for Freedom comprises 24 short stories from new writers and established authors, all inspired by the theme of women’s suffrage. Some are contemporary, some historical, one is set in the future and one is about creatures from a different planet – or is it? The Word for Freedom explores women’s experiences across the world and throughout time. Through the varied stories it shows the ways they have been exploited, manipulated, kept down, controlled. But it also highlights all the many ways that women have been strong and supported each other and fought for their rights. I just want to mention a few of the stories which really appealed to me. It was good to read the familiar story of how Emily Davison hid herself in a broom cupboard at Westminster on the night of the census in 1911 as seen through the eyes of the Clerk of Works on duty that evening in Christine Powell’s Counting for England. Although Katherine Blessan’s Sayyida Nanda is a dark tale of forced marriage, it was so beautifully written that it is one of my favourites. Enid is Going on a Journey by David Cook had me cheering on Enid as she struck out for freedom after decades of marriage. Anne Hamilton’s Not Our Kind of Girl was thought-provoking and showed how certain attitudes have changed over the years. One final story I want to mention is Gristle by Angela Clark. This was a very entertaining tale of a woman who had been exploited taking her revenge and I have to admit I was cheering her on despite what she actually did! There is something for everyone in this book. There are stories which will make you smile, laugh, cry or think. It will make you appreciative all over again for what women did in the past to give modern women the lives we have. But it will also make you think about how women in various situations throughout the world still have to struggle for acceptance, equality and recognition. Through this anthology Retreat West Books is proud to support Hestia and the UK Says No More campaign against domestic abuse and sexual violence. A collection of 24 short stories celebrating a hundred years of women’ suffrage, from both established and emerging authors, all of whom have been inspired by the suffragettes and whose stories, whether set in 1918, the current day or the future, focus on the same freedoms that those women fought for so courageously. A clerk of works at the Palace of Westminster encounters Emily Davison in a broom cupboard; a mermaid dares to tread on land to please the man she loves; a school girl friendship makes the suffragette protests relevant to the modern day; a mother leaves her child for a tree; an online troll has to face his target; and a woman caught in modern day slavery discovers a chance for freedom in a newspaper cutting. These stories and many more come together in a collection that doesn’t shy away from the reality of a woman’s world, which has injustices and inequalities alongside opportunities and hard-won freedoms, but always finds strength, bravery and hope. Cath Bore, feminist short story writer and broadcaster. Sounds excellent – thanks for flagging it up, Joanne!